Introducing free to download program packs and the Sound Librarian that lets you import, load, save and manage your program data. 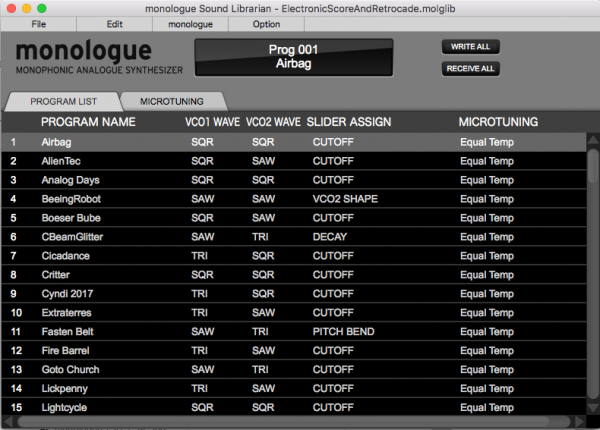 The monologue Sound Librarian lets you easily reorder and organize the programs inside your monologue and has the functionality to save your program library on your computer. In addition to managing your programs, it is used to load factory and bonus libraries distributed by KORG. 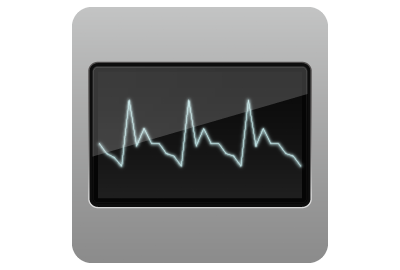 Drag and drop the preset data (.molgpreset) onto the monologue Sound Librarian icon to add it to your preset data window. You can view your preset data window by clicking Option > Open Preset Window. Please refer to Operation Manual included in the monologue Sound Librarian for further details. Sound Packs vol.1 "Electronic score and Retrocade"
All users of the KORG monologue can look forward to new “sound food” for their beloved synth! 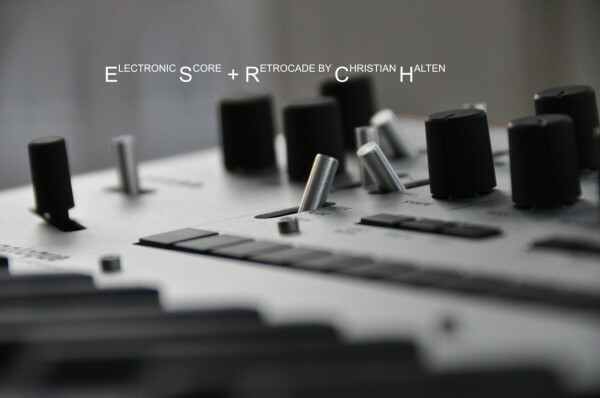 Electronic Score & Retrocade is the new sound library by film composer Christian Halten. Expressive sounds that trigger direct visual associations are the main axis of this library. Chiptune or film scoring: you will find something for you! From "Oxygene" to "
monoModel", "Sarlacc", "Lightcycle" or "CBeamGlitter", the pictures are now at your fingertips. Strange rhythms like "Firebarrel", "Snow on Mars", "Pong" and "Squirrel" can bring that certain something into your own productions. 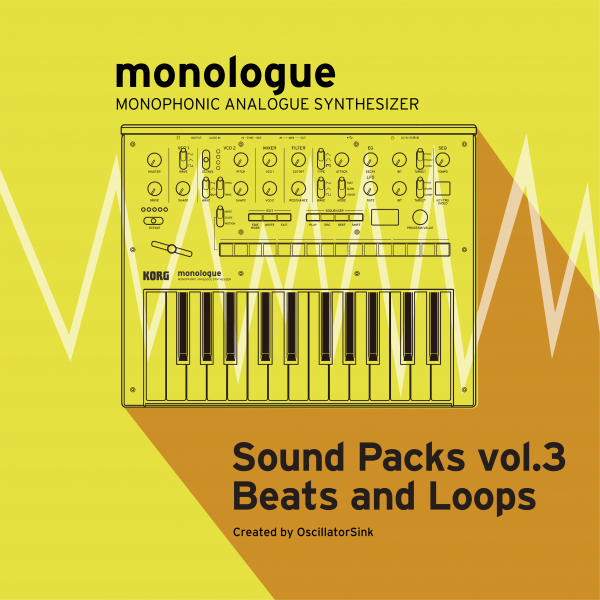 Let yourself be inspired and explore this new sound palette on your monologue. Christian Halten works as a film composer in Berlin. His focus is on music for feature and documentary films with special concepts. The creation and exploration of new instrumental sounds is always the starting point of his work to further expand the visual imaginary with fresh ideas. This method of working also led to the creation of its sampling software SampleRobot, which has been a huge success for the last 12 years. Christian Halten studied film music in Ludwigsburg and then worked in the composing teams of Henning Lohner and Hans Zimmer in Los Angeles. 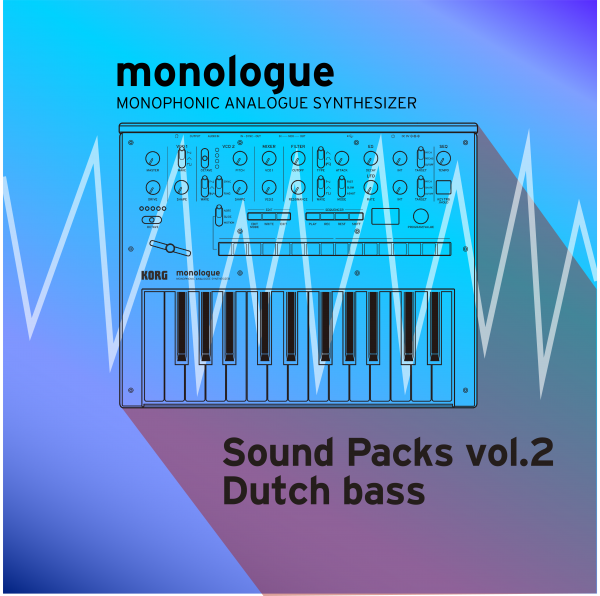 Download "Electronic score and Retrocade"
Sound Packs vol.2 "Dutch Bass"
A brand new bank of bass patches for monologue users. 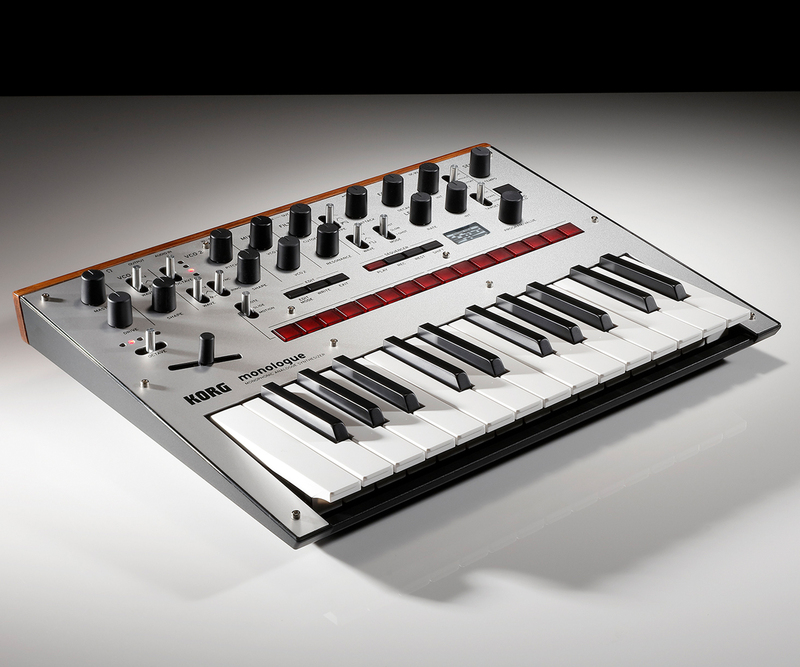 "Dutch Bass" is a new sound library for the KORG monologue by Dutch sound designer Mark Gijsman. This is a synthesizer bass dedicated pack, with lots of fat and crunchy basses to choose from and suitable for any genre of music. It also features some vocal type patches and drum loops for good measure. In addition, each one of the 31 programs includes an original step sequence to take your music to the next level! 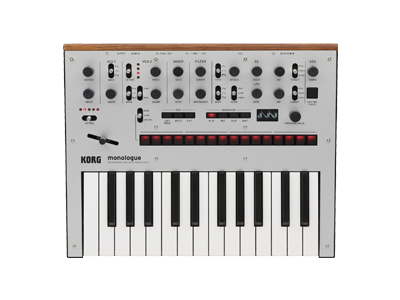 Thanks to the monologue’s exceptional sequencer you can turn it into a drum machine, and using a monosynth that way can yield exciting, unique percussive loops and textures that you'd just never arrive at with conventional drum machines. Even though any of these patches can be played normally on the keyboard, the real fun comes when you start the sequencer. Each patch is designed to be a standalone loop which you can use out of the box. The mod lever is set to offer instant tweaking gratification, but playing with the other parameters can reveal all sorts of new expressions. You can also try enabling and disabling the sequencer steps, tweaking the motion sequence and changing the notes in the sequence. (please note that because some of the patches rely on tempo-synced LFOs, you may need to restart the sequence after changing patches). These loops also sound great with additional processing - try adding compression, saturation, delay, reverb etc. in your DAW or on your mixing desk to enhance and augment the loops.